Acquired from the artist by Sir Kenneth Clark, 1941; (Marlborough Fine Art, Ltd., London); William S. and Ruth B. Benedict, Washington, DC, late 1960s; gift to NGA, 1987. NGA Master Drawings 1978, p. 127. Art for the Nation: Gifts in Honor of the 50th Anniversary of the National Gallery of Art, National Gallery of Art, Washington, D.C., 1991, 354-355, color repro. A Discerning Eye: Prints and Drawings Given by Ruth B. Benedict, National Gallery of Art, Washington, D.C., 1994: no. 78 (exhibition brochure). A Century of Drawing, National Gallery of Art, Washington, 2001-2002, no. 73. A Century of Drawing. Exh. cat. National Gallery of Art, Washington, 2001-2002: no. 73. Garrould, Ann. 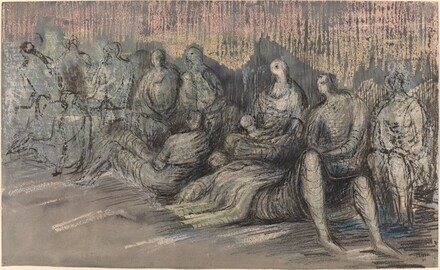 Henry Moore, Volume 3, Complete Drawings 1940-49. London: Henry Moore Foundation in Association with Lund Humphries, 2001.